I’m typing my recipe on here because recently I lost it for a few months (all my recipes are on index cards and I have been known to mislay them). 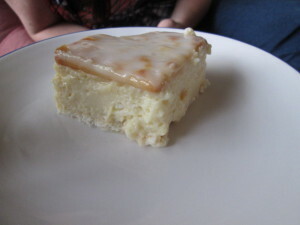 This recipe was given to me by a work colleague Dorene about 10 years ago and it is a big hit in my home. They are easy to make and the filling is deliciously creamy. I have been known to use a batch as bait to lure my older children around for a visit. Yesterday I made them to take to a housewarming party at my eldest Daughter’s new home. Top with another layer of crackers, lines following in the same direction. 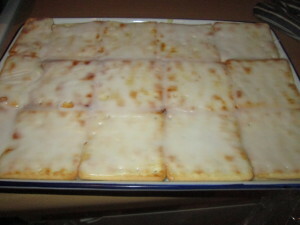 I lost my custardslice recipe, but new what is should look like, (more or less, lol) This is THE ONE!! Thanks for sharing!! A super recipe, easy and delicious! Thanks for sharing. Definitely a recipe I’ll use again and again! This looks the same as my mom’s … She lost her one and I’m in the mood to make this for my birthday. Got the recipe now a day before the time. So now the office (and home visitors) are getting custard slices and not cake. Thanx. Hi must the custard be cold before I put the icing over??? ?